There’s no doubt about it: a bicycling culture is budding in Mumbai. 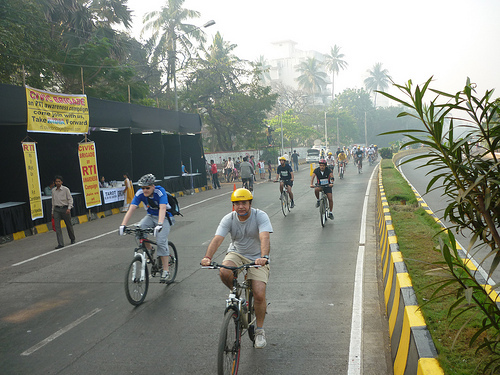 All in the past month, TheCityFix Mumbai reported on the city’s first Car Free Day, which coincided with the city’s first “Cyclothon and a group of long-distance cyclists riding from Bangalore; and the new trend of evening cycling. Now, Mumbai has joined the growing group of cities around the world with bike-sharing systems. Two bicycle-sharing programs have just been launched in the northern part of the peninsula – Cycle Chalao and FreMo. Their stories are very different – the former was started by a group of students, the latter by a former financial CEO – but they’re both after the same goals: fighting climate change, improving mobility and making Mumbai a better place to live. Cycle Chalao, a bikesharing program started by I-Initiate, believes in "providing opportunity for people to put their awareness on climate change issues into action." Photo via i-initiate.org. 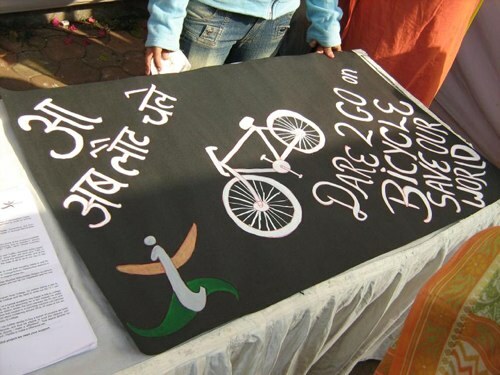 Cycle Chalao was started by an organization called I-initiate, a project of four business/social entrepreneurship students at Narsee Monjee Institute of Management Studies. Jyotika Bhatia, Jui Gangan, Rajkumar Janagam and Bhaskar Asgaonkar see bike-sharing as a way for people to act on their concerns about climate change. To facilitate this action, they aim to set up a network of high-end bicycle rental services catering to students and young professionals. The pilot project, kicked off in January, is located in Mulund, where the railway station is located at a distance from Kelkar College and commuters must use auto rickshaws to move between the two. Bicycle rental can save students money and time and provide fitness and environmental benefits. Students can rent bikes on a daily or monthly basis. Costs range from Rs 3 (for international readers, this is roughly equivalent to $0.07) for one half hour to Rs 150 ($3.25) for one month. Members must produce their voters’ ID or college ID cards. Bicycles are available outside the station or at the college. Cycle Chalao’s 30 cycles each have two seats and two sets of pedals, and a bike with cell phone charging capabilities will soon be available. Advertisements will appear on the bikes to generate revenue for the program. In its first month of operation, Cycle Chalao has seen success. Students have greeted the program with enthusiasm, and it already has 250 members. “We spend Rs 3 for a half-hour trip, much cheaper than taking a rickshaw. We not only save money but also have fun cycling with friends and leave a much lighter carbon footprint,” said one student. Additionally, the organizers have gained the support of the Rotary Club and the endorsement of the Maharashtra Pollution Control Board. They hope to expand Cycle Chalao to other campuses in the near future. Down the road in Thane, V. Ramesh had a similar vision to Bhatia, Gangan, Janagam and Asgaonkar. After a trip to Barcelona where he learned about the city’s Bicing program, Ramesh quit his well-paying job as CEO of a brokerage firm and devoted a year to the start-up of bike-sharing in Mumbai. He came up with FreMo, a project of his new company EcoMove Solutions Pvt. Ltd.
Like the organizers of Cycle Chalao, Ramesh sees his project as part of a bigger environmental effort. “We talk a lot about global warming but hardly work towards curbing it,” he says. “The whole point is to encourage people to use cycle. It will help fight against [climate change].” With its convenience and money-saving benefits, FreMo will likely also help move bicycling into the main stream. Ramesh sees cycling as something that will appeal to everyone, from commuters to students to fitness buffs. Users avoid waiting in long lines for a bus or a rickshaw, haggling with drivers, or sitting in traffic. People interested in biking to work or for exercise can do so without worrying about bike theft, a common problem. 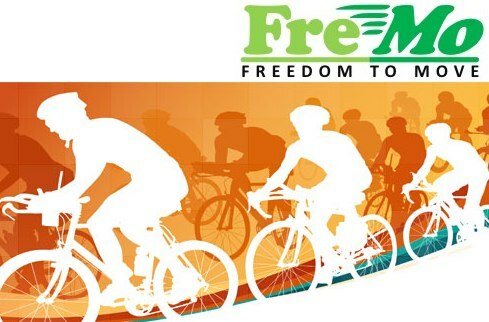 FreMo (whose name stands for “freedom to move”) has kicked off with five depots and 100 cycles in Thane. To join, one must pay a deposit of Rs 2,000 ($44) which is refundable with the termination of membership, as well as a Rs 499 ($11) registration fee. Various membership plans are offered, ranging from Platinum (cost is Rs 1440 and users are charged Rs 0.08 per minute) to the Flexi Plan (with a minimal charge to sign up and users are charged Rs 0.30 per minute.) All members are provided with personal accident insurance. To check out a bicycle, members swipe their access cards at any depot. The depot supervisor will help them choose a bike. Helmets are provided but not mandatory. The program’s green cycles are unisex with ample storage space for commuters. Ramesh hopes to build on FreMo in the future, possibly starting bike-sharing programs in other Indian cities. Cyclists enjoy the city’s first Car Free Day. Photo by Madhav Pai. Time will tell how well Cycle Chalao and FreMo fare in Mumbai. No matter what, this flourishing of bicycle-sharing is a positive sign for the city’s cycling culture and environmental awareness. So far, it appears that entrepreneurs are successfully adapting international bike-sharing models to local needs (for instance, by integrating it with public transit, on which the majority of the city’s population depends) and focusing on the most attractive benefits to users (including economic, time-saving and environmental.) Let’s hope this is just the beginning of a vibrant bike culture in Mumbai.